If I had seen this car earlier I would have included it in the Weekend Quickies. That's one of the problems with writing this blog and having to work for a living. There are so many great cars out there, but not enough free time to find them all. I've always like TVRs. I've written about them in the past. On the short list of cars I'd like to one day see in my garage is a TVR 350i. On the slightly longer list is the 2500M. Yeah, I know, TVRs can be a handful to drive and their build quality left something to be desired, but, as Just A Car Geek reader Alden once commented, "the things that gives cars character are their character flaws". Like most of the cars built by Great Britain's once amazing cottage auto industry, the TVR has tons of character. There is not much I can write about this car. The eBay listing, with a some nice large, clear pictures, tells the story. It's just a very nice, clean 2500M. 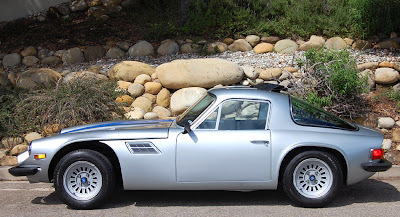 Click here to see the eBay listing for this TVR 2500M. Click here to see a Hemmings article about the 2500M.